Whether it's your first or your 10th, joining a new larp can be daunting in many ways, one of which can be obtaining costuming and makeup for your character. Most of the time, you don't want to immediately sink a ton of money into this, as you may be apprehensive about whether or not you'll like the game....but you also want to look good. For seasoned larpers, you can often borrow from your kit if the new game is similar to other games you've played. But what about when it isn't? What about when you're brand new to larping and costuming? Is it possible to dress for Steampunk if you've never larped or if you've only played genres vastly different from ours? Yes. The main aesthetic for Aurum, Steampunk, is characterized by a predominantly Victorian England (1860s - 1900s) style - top hats, vests, bustles, spats, jabots/cravats, etc, as well as hints of the overall Industrial Era - goggles, aviator hats, gears/sprockets, and lots of brass or copper. Because our world incorporates magic and has a lore steeped in traditional medieval fantasy, you may also see some limited trappings of that style as well- billowing cloaks, large tomes, alchemy vials, and so on. Thrift stores such as Goodwill are your friend in this case. Goodwill often has $1 Sundays, where about 20% of their current stock, regardless or previous price, costs $1 each for the day. This is where you can get staple pieces, long skirts with ruffles that you can hike up, plain vests, dress pants or khakis. Sometimes if you're lucky, even a good bowler or pageboy hat! A good chunk of our NPC costuming has come from weekly trips to Goodwill to scope out the sales. 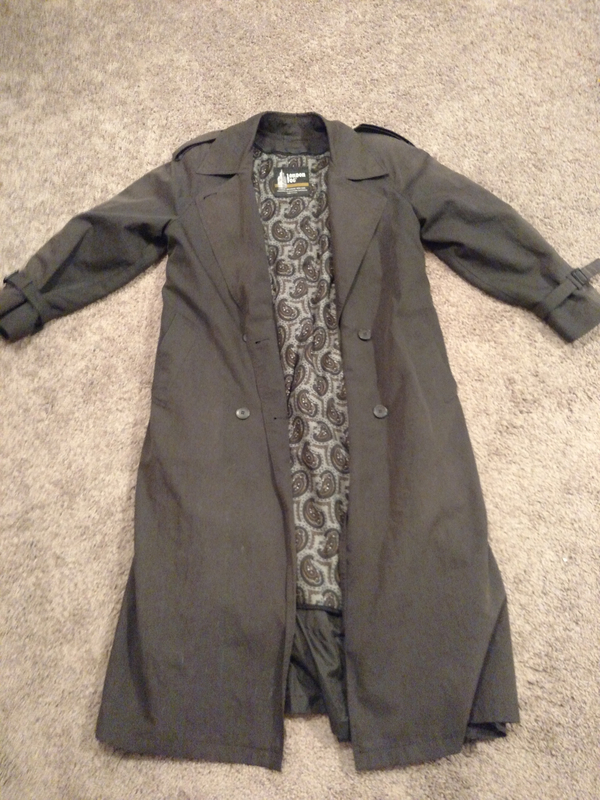 We got this coat for $1 through Goodwill! Next, there are Halloween stores. The quality is not great, but if you go around Halloween or right after, you could get a felt top hat for a few dollars and then decorate it with lace, ribbon, plumage, whatever your heart desires for a few bucks more. 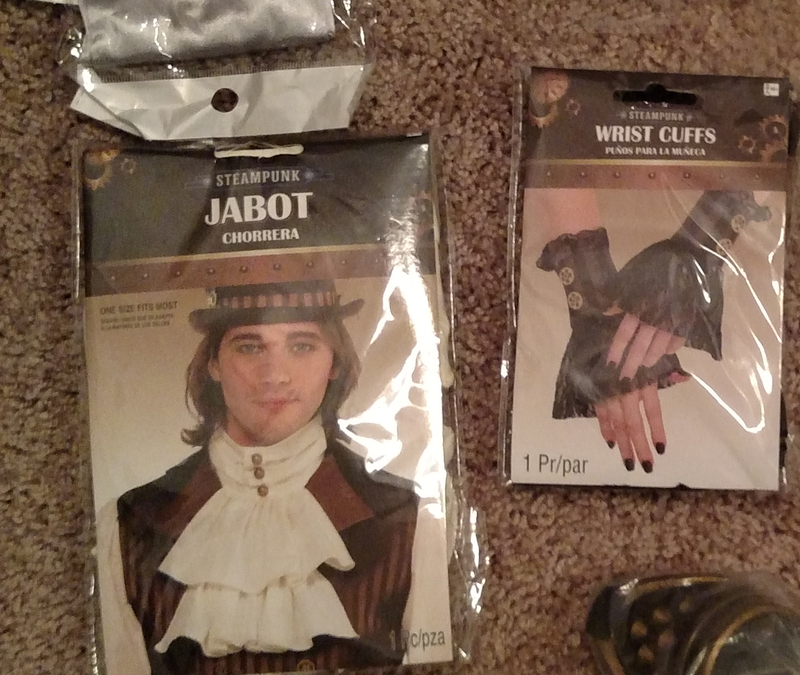 They also tend to have accessory kits with things like pocket watches, fingerless gloves, monocles, or neckles. Recently, I've been seeing entire costumes as well that may prove a good starting outfit for your character. Online, overseas stores like Wish and AliExpress can be incredibly frugal choices but buyer beware: There have been complaints of identity theft after using these sites so check out who you're buying from and make sure they have lots of reviews and high ratings. You may also ed up having to wait a month for shipping, so this is not a good choices for when you're in a costuming crunch. Finally, the quality can vary. We have had luck buying goggles and lace gloves through Wish and the quality was fine but someone else bought a necklace and bowtie that immediately broke. All four of the items described were $1 each plus $1-2 shipping, so you're not losing out on much money, but when you're trying to be frugal, every wasted dollar hurts. Etsy is a popular site and can be helpful for more niche items (Nisse/Kobold ears, Dur beards) but definitely do your homework: Prices vary wildly from seller to seller, as does quality. We have had luck purchasing wrap pants and some more specific NPC gear through here. Finally, we would like to recommend Crafty Bird Secrets and Hero's Edge (specifically their 'latex rubber foam' swords and daggers only) if you are looking for weapons. Crafty Bird Secrets crafts 'boffer' weapons made from PVC pipe, foam, and duct tape and is almost solely responsible for our NPC collection of boffer weapons and shields. Price tend to start around $15 for a basic weapon and increase from there depending on design, requirements, etc. Hero's Edge are latex weapons that look more realistic but also have a slightly higher cost due to this; proces start around $18 for a dagger and $25 for a sword. Now that you've got your costume sussed out, you realize that you want to play a species other than our generic human. Maybe you want to play a Wayfarer, who needs a compass rose tattoo prominently displayed somewhere on them. Or perhaps a Kobold, who needs green around their eyes. Maybe an Afsla Nisse, with purple runes on their faces? There are several popular brands of stage makeup that are often used for larp- Mehron, Ben Nye, Kryolan, Aquacolor. But at around $15+ per pot of color, that's not terribly frugal. Who wants to buy a pot of grey makeup for a Vrachos Dur only to find out you'd rather play a Vand Nisse, who use blue makeup, and now you have no use for the grey. 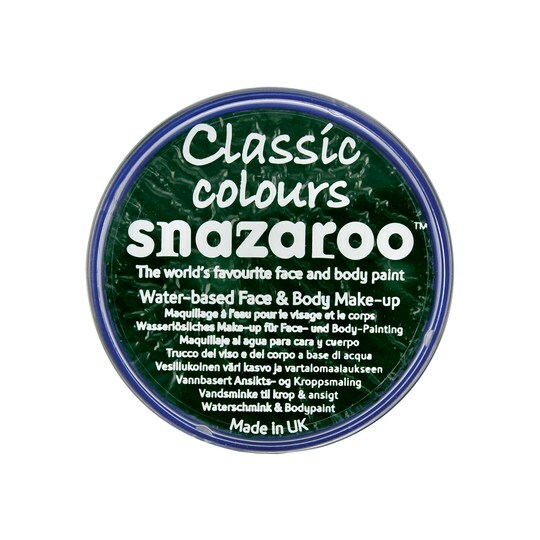 A different option we suggest is Snazaroo. The quality is on par with more expensive or more well-known brands, but at rock bottom prices. The trick we use is to get it at Michael's craft stores. One pot costs $8.99, but Michael's almost always has an online coupon (you can use it in store!) for 40 - 60% off one regular priced item. That comes to around $5.50 for one pot of makeup- not bad! What about for characters that are Afsla Nisse, Vand Nisse, or Wayfarers, where using a pot of paint and a brush may not be the most elegant solution? It's a bit of a mouthful, but felt-tip liquid eyeliner is the perfect solution. If you can find it waterproof, even better. We have been using Palladio eyeliner in Eggplant, Navy, and Brown, respectively, for these species. We got them on sale for $6.50 though they usually cost around $10. Eyeliner pencils are even cheaper- usually only a few dollars. The only downside is the line tends to look a bit more fake or chalky than the line from a liquid eyeliner pen. So there you have it! Armed with these suggestions, your character's first debut should be fun, adventurous, And fashionable! Can't wait to see you there!